The course is primarily for the students of physical science stream who are interested in studying physics and are hoping to pursue knowledge and skills to succeed in a career in science, education, industry and management. 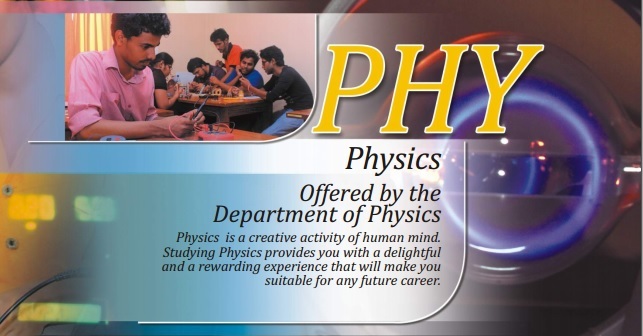 The Department also welcomes students with a biological science background, who are seeking career opportunities where both physics and biology are involved, to read physics as a subject. They are even eligible to read for a Special Degree in physics provided they reach the required standard. The Bachelor of Science General Degree is designed to provide you with the necessary knowledge and skills to succeed in the career of your choice. Opportunities include positions in scientific and educational services, position in industry etc. The B.Sc. Degree could open doors to these possibilities and many more. Physics is a natural science which encompasses a vast array of sub-fields ranging from the, solid state and sub-atomic regimes like Nuclear and Quantum physics to the study of the universe through Relativity and Astrophysics and the everyday applications such as Electronics and Optics. A degree in physics offers you not only the subject knowledge but also to be creative and think differently. It equips you with the analytical and personal skills that are essential for personal development, for any path you decide to take in future. The Bachelor of Science General Degree spans over three years. The students are required to take course units in Physics with minimum cumulative credit value of 27.0 during the three years. The course units comprise of ‘compulsory’, ‘core’, ‘non-core’, ‘optional’ subjects so that the students are provided with the core knowledge of the physics stream while allowing some level of flexibility of pursue optional interest. PHY 207 1.0: Knowledge in algebra is a perquisite for this course. In addition to the above optional units, the students may offer any one of the B.Sc. (Special) Degree units if they have necessary prerequisite knowledge and if the time table permits. Decision with regard to the suitability of a student to follow such a unit shall be made by the lecturer in charge of that unit.